April 1st 2019. Coaches Across Continents is delighted to announce a new Corporate Legacy partnership with Colombian company Saeta Internacional Sports Wear SAS who manufacture and distribute the Haiti national football team jersey. 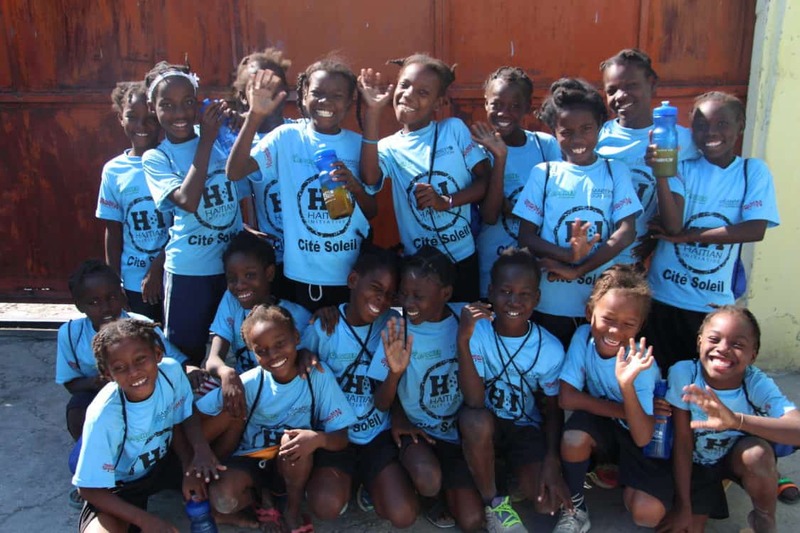 Starting April 1st 2019 Saeta will contribute a portion of every Haiti official football team jersey sold to CAC’s Education Outside the Classroom work in Haiti. In 6 years we have educated 875 Haitian coaches helping them provide Purposeful Play to over 35,000 at-risk youth across the country. Now when you purchase a premium Haiti official team shirt you will also know you are improving the lives of children in the country. To buy your shirt today go to this link- https://saetasport.com/tienda/fanshop/haiti. Coming soon to Amazon! 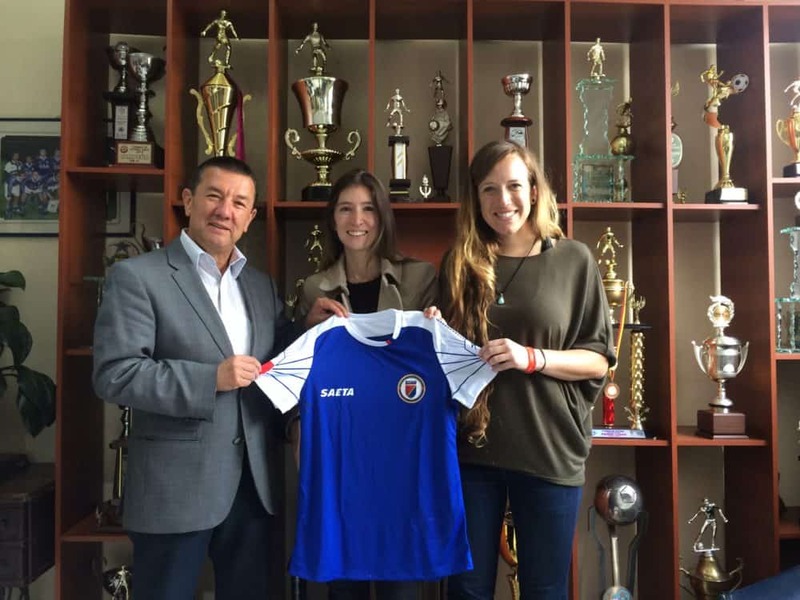 Coaches Across Continents se complace en anunciar una nueva asociación con la compañía colombiana Saeta Internacional Sport Wear SAS, que fabrica y distribuye la camiseta del equipo nacional de fútbol de Haití. A partir del 1 de abril de 2019, Saeta aportará una parte de cada venta de la camiseta oficial del equipo de fútbol de Haití al trabajo comunitario de CAC en Haití. En 6 años, CAC ha educado a 875 entrenadores haitianos, apoyándoles a generar espacios del ‘Juego con Propósito’ y ‘Educación Fuera del Aula’ a más de 35,000 jóvenes alrededor del país. Ahora, cuando compre una camiseta oficial del equipo de Haití, también sabrá que está mejorando la vida de las niñas y los niños en el país. Para comprar su camiseta hoy, vaya a este enlace: https://saetasport.com/tienda/fanshop/haiti. ¡Próximamente en Amazon! Saeta Internacional Sport Wear is a Colombian company that operates its business in the textile sector, in the manufacture, import and export of sportswear and accessories. Since 1982 they have manufactured and partnered with professional clubs across Colombia including Santa Fe, Cucuta Deportivo, Valledupar, and Choco Unido C.F. They have manufactured the Haitian national team jersey since 2013 and recently signed a new 4 year contract with the association. CAC Design, Develop, and Implement Cause Marketing & CSR initiatives that provide corporations and foundations with sustainable social development programs. We engage employees, enhance global brand reputation, and create return on investment. We have delivered initiatives addressing the UN SDG’s in 23 countries with: Chevrolet, Nike, Standard Chartered Bank, AFC, MJYL, ESPN, Bloomberg, & more. January 31st 2017. 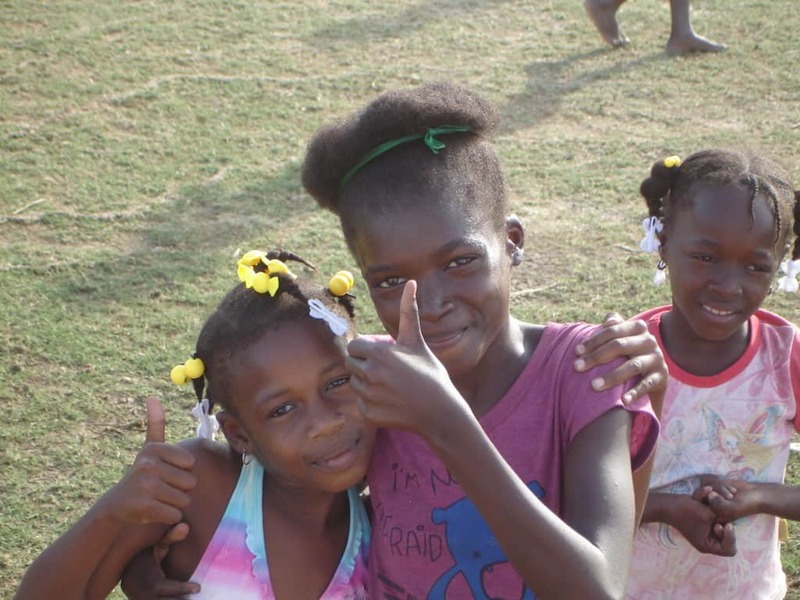 CAC Global Citizen Taylor Allen writes about her experience working with CAC and the Haitian Initiative in Port-au-Prince, Haiti. Upon arrival into Port-au-Prince I could already get a sense of the bustle around the capital city. Our partner arrived at the airport shortly after we landed and drove us to the guest house the CAC team would be staying for the week. The sun was relentless in its heat and humidity, and the amount of cars we saw on the road could rival the infamous Los Angeles traffic. The sidewalks were full of vendors selling t-shirts, shoes, electronics, rice, beans, fruits, vegetables, and drinks. We arrived at the beautiful guest house the local partner offered to CAC, with a beautiful pool in the courtyard, wi-fi, electricity, and three prepared meals a day. The continuous energy that welcomed us as we walked off the plane was the same energy that surrounded us for the remaining two weeks on and off the field. It was an amazing opportunity to get the chance to play in Haiti’s National Stadium. The stadium is located near the base of a mountain, which made the views all the more beautiful. Every morning we’d pile into the car and drive for an hour to get to the field that was three miles away. Streets were busy every morning with young children dressed in their school uniforms walking to class along the sidewalk with motor bikes zooming in and out of traffic. This past week we had a total of ninety participants, among them were coaches, players and students. The partnership with Haitian Initiative (HI) is in its fifth year, therefore, the decision was made that by the end of the week Coaches Across Continents would be there as support, while the coaches of Haitian Initiative would run a futbol for social impact program with CAC curriculum and their adapted games they’ve created over the last five years with the participants. 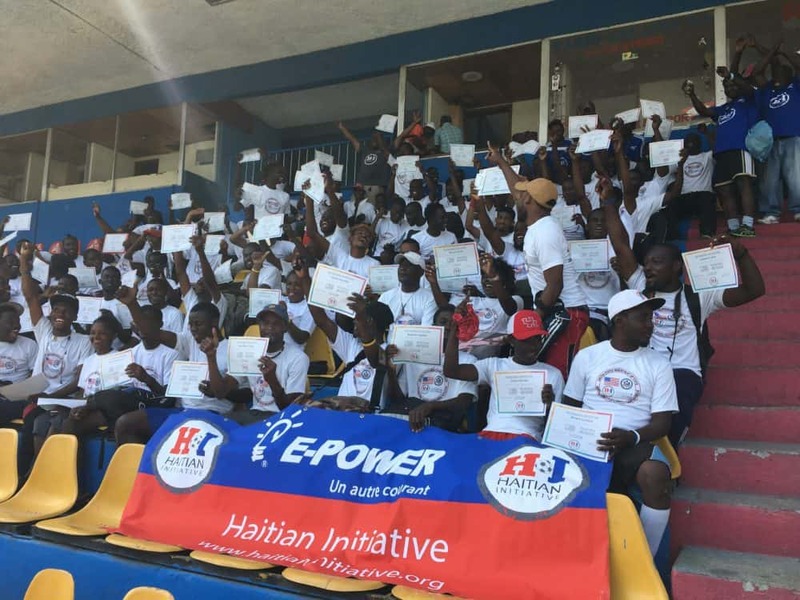 The games included some from CAC Curriculum, class sessions with CAC, and adapted games created by Haitian Initiative coaches specifically for the local issues they wanted to address as leaders in their communities. In the middle of the week, inspired by CAC staff Emily Kruger and Jordan Stephenson, Haitian Initiative coaches decided to create a list of criteria that they believe encompasses a successful training session for self-assessment and peer-assessment to make improvements. Once this list was created, every afternoon following, the HI coaches would sit down and run through each session from the day and check off (or not check off) the boxes. In doing this, we saw noticeable improvements each day! HI coaches took full ownership of running the program for the week by Thursday and Friday. 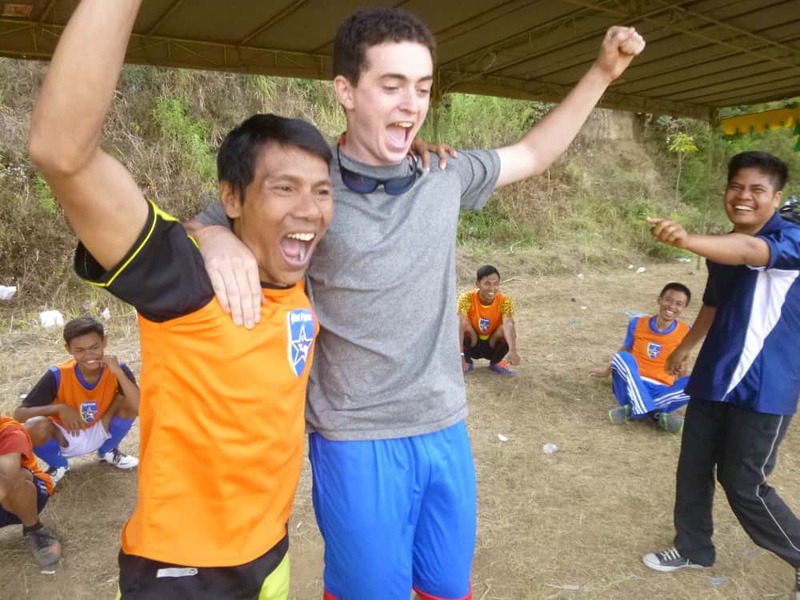 It was incredible to see CAC’s program come full circle and achieve the goal of sustainable social impact through sport. One of my favorite moments this week came from an HI coach named Astrude. Among the HI coaches, there are about four women. One of the women is a powerhouse, she’s one of the best coaches within the group, male or female, her name is Marie-France. When the participants were split into smaller groups, Astrude was paired with Marie-France. I had never really heard Astrude speak, she was quiet and kept to herself often. Then the day came, I could hear and feel her presence on the field, and ran over to catch the rest of the session. She took initiative (no pun intended), she was prominent, she was confident, she was heard, and she knew the game. Not often did I see a woman leading a group of men this week. Astrude was as confident as the best of them while leading a group of twenty-five men in teaching skills and proper technique. She was knowledgable and is a great player to begin with, so you can tell she was comfortable. What an inspiration. She’s surrounded by talkative men throughout the day, but when it was her turn to step up, she filled even the biggest shoes. This week was a lot to take in and a bit challenging at first, from sights to smells, to navigating communication without being able to speak the same language. I was lucky enough to learn from the leadership of CAC’s staff Emily Kruger and Jordan Stephenson. They are great role models to follow when it comes to circumventing new and unfamiliar situations on and off the field. I couldn’t have asked for a better team to be a part of. I’ve learned a lot, met a lot of new people, learned a lot of new games, built new friendships, and look forward to keeping in touch with the inspiring coaches I’ve met on this trip. Thank you Coaches Across Continents for sharing what you do and allowing for opportunities, like this, for people like myself to volunteer. I look forward to my next trip to Mexico with CAC! January 23rd 2017. 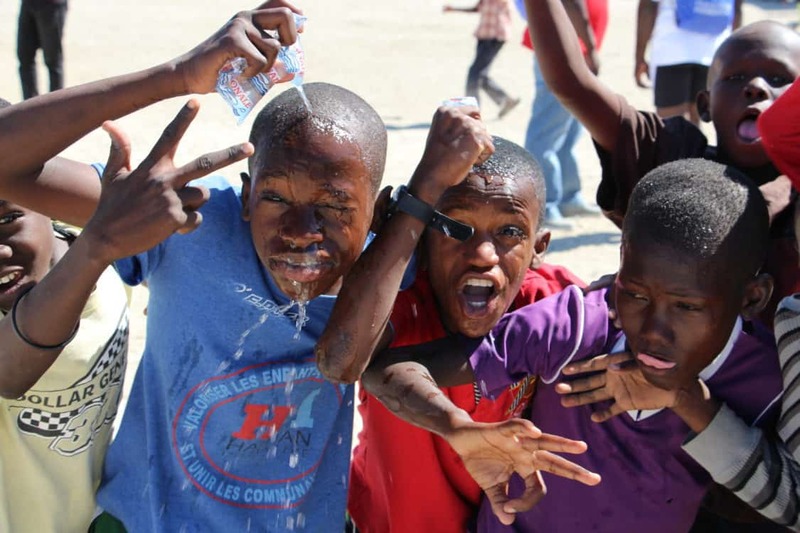 CAC Global Citizen Jessica Li writes about her experience with CAC and the Haitian Initiative in Port-au-Prince, Haiti. This partnership is supported by USAID. Sitting back in my dorm room in Cambridge, I can’t quite believe that I’ve just come off an absolute whirlwind of a week in Port-au-Prince. 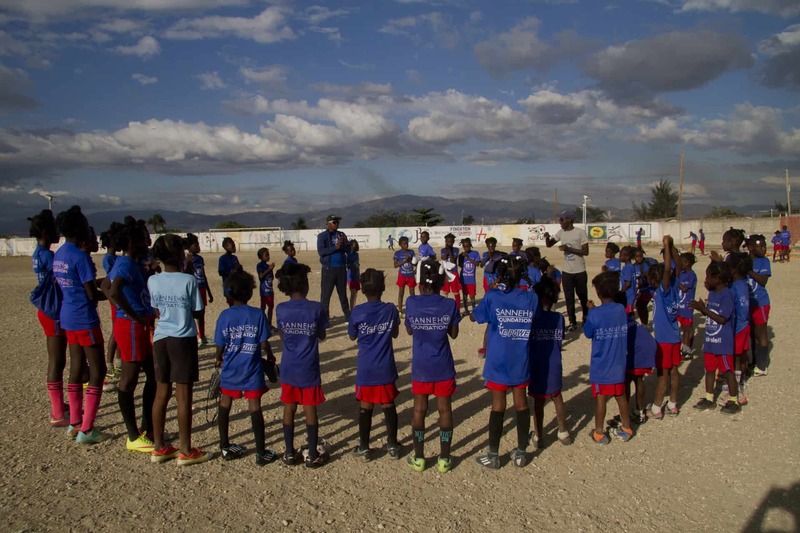 Last week marked the fourth year CAC has worked with the Haitian Initiative (HI), a program that uses soccer as a catalyst to combat the cycle of poverty for Haitian children. In the neighborhood of Cite Soleil, children face a high risk of gang violence, hunger, and HIV/AIDS. Children must consistently attend school and have passing grades to participate in the program. The program includes six days a week of practice or games as well as English class and a hot meal. For the majority of the children, that meal is the only one they get each day. 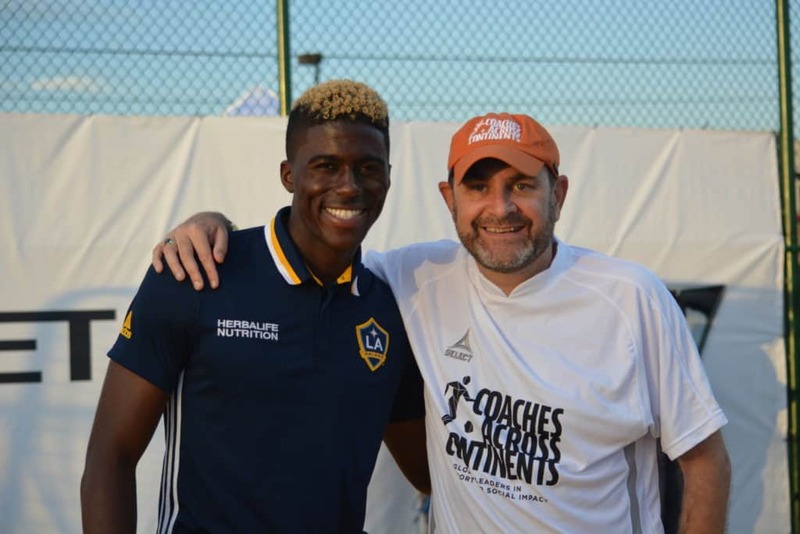 While CAC has partnered with HI coaches for four years, this year’s program included 150 new participants, including students, national team players, and coaches of all ages. Luckily, the HI coaches were familiar with many of our games and could help us manage such a big group! 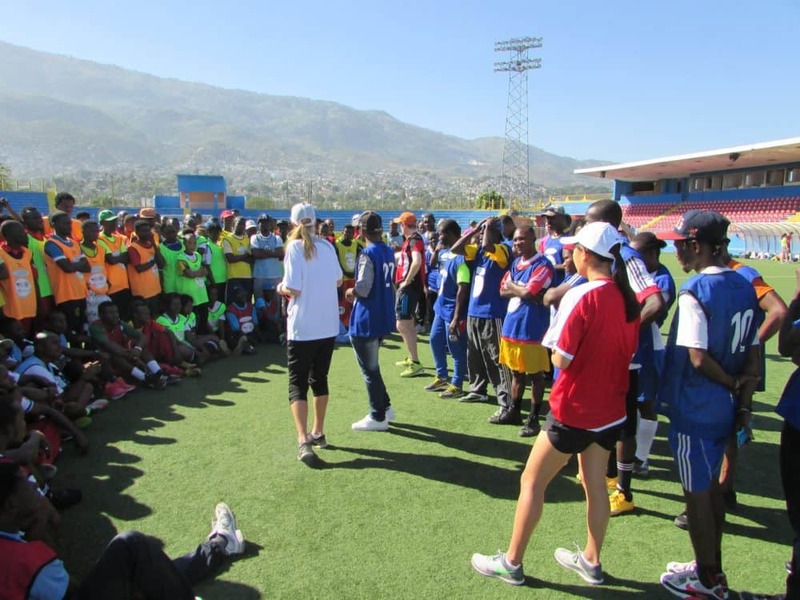 Our sessions were conducted at the Haitian National Stadium, a real treat for both us and many of the participants. During our drives to the stadium in the morning, we’d see people carrying objects of all shapes and sizes on their heads, pigs and other live animals roaming the streets, and all types of street art. The other thing we noted was that music was playing everywhere, whether from buildings, cars, or random speakers on the street (this fact made for some interesting moments during the week when we’d be hanging out with Titanic music playing in the background). The stadium itself is located near the foot of a mountain range, providing a bit of a respite from the chaotic streets and making for incredible background views. Upon arriving on the first day, many participants were already waiting for us, several of whom excitedly greeted Emily, who had worked with them last year. Jordan, Taylor (another Global Citizen), and I smiled when we saw this and eagerly anticipated forming our own connections with the participants. Throughout the week, I was struck by the incredible energy the Haitian participants brought to each session. They never hesitated to break out a dance move, and many a time I found myself suddenly engulfed in crowds of cheering and chanting coaches. They also never failed to make us laugh; once, when asked to find creative ways to cross the Circle of Friends while touching a partner, we not only saw coaches carry each other in all sorts of ways but also holding each other’s noses and ears. However, the coaches were also able to combine fun with serious conversations about ways in which they hoped to change their communities. They envisioned a Haiti with increased opportunity, equality, and hope. A particularly powerful conversation occurred after playing India for Knowledge, a game where teams label each cone as a women’s right and then race to the corresponding cone when the coach yells out that right. Although the group consisted predominantly of men, they came up with women’s rights such as the right to a voice, an abortion, equality, and respect. When asked whether women in Haiti currently have these rights, they all said no but that this fact should change. They genuinely wanted women to be their equals and saw them as integral members of society. Later, we used this list to start a conversation with just the women about creating and implementing a women’s rights policy. It filled us with hope to see the women creating a WhatsApp group, a network of support among strong and intelligent women who didn’t know each other prior to the program. We hoped they would continue to discuss ideas and inspire one another moving forward. This week has given me an incredible glimpse into the power of sport to transform communities. 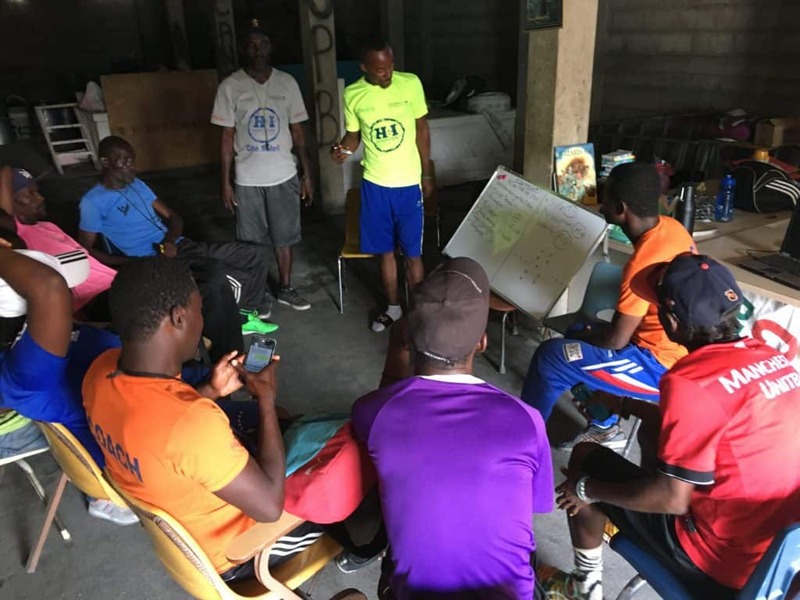 The HI coaches could discuss ideas for their own games or how to adapt our games with us, and we loved that they could help lead their fellow Haitian coaches. This week we were able to include 150 more coaches into the movement and know that many of them will also become leaders in enacting change. December 19th 2016. 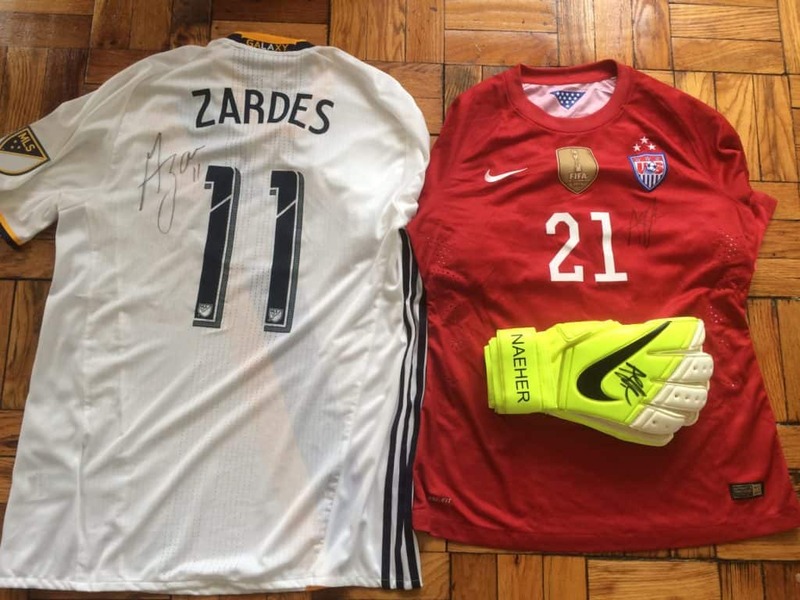 It is your last chance to enter our competition to win signed gear from US Men’s and Women’s soccer players! The deadline is Friday December 23rd at 12PM EST so please donate as soon as possible to have your name added to the draw. May 11th 2016. 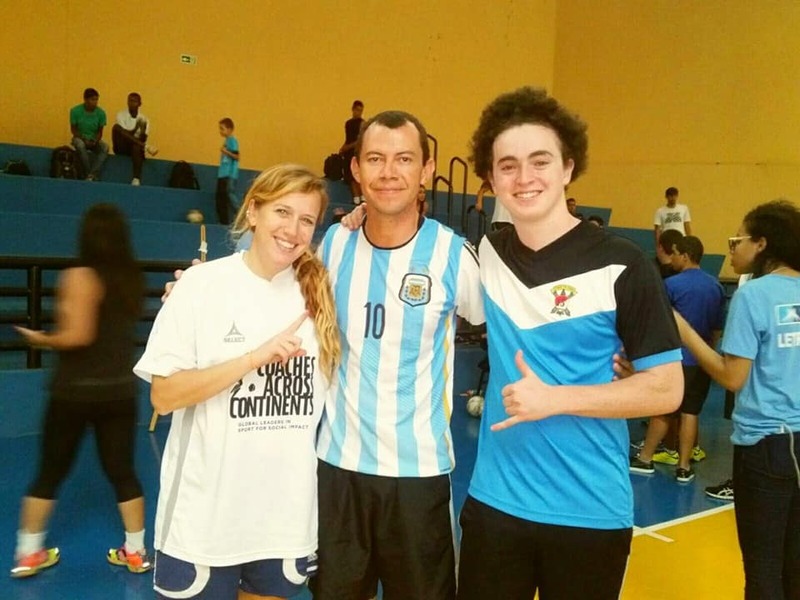 CAC’s long serving volunteer CJ Fritz wrote about his full experience with the organization on 4 continents! Full disclosure, what you are reading is my sixth draft of this blog. After seven incredible months of working with CAC, when our program in Diadema ended, so did my volunteer trip with this incredible organization. I asked a few weeks ago to reserve the chance to write this blog because it would be my last. I thought it would be a breeze, a little heartfelt note to CAC that would take no less than an hour to write. Now after trying 6 times and spending far too long staring at a blank document, I realize how difficult describing CAC is. CAC is ever shifting and adapting, so getting a line on it and pinning it down would be near impossible. Seven months ago, I was nervous — terrified, really — about what I had gotten myself into. I arrived in Indonesia in late August for my first program not knowing what was coming and seriously doubting every decision I had made in choosing to take such a crazy journey. Now, in early April, I’m nervous –terrified, really — that nothing can possibly live up to working with CAC. CAC is sleeping on plastic mattresses on the floor of a building with no running water and more power outages than chickens in the yard. CAC is having one of only two women in a program give you hope for change when she speaks up in front of 60 men about respecting women. CAC is having to leave a country before you realized that you had really arrived, on to the next program. It is rickety buses, fantastic stories, questionable bedspreads, big breakthroughs, optimism and definitely some disagreements. CAC is coming to a community and asking what problems the participants want to solve instead of telling them what to solve. CAC is the process of giving useful tools and then getting out of the way: letting a community use all or none of what we present and trying not to impose. It is confronting huge issues head-on, long travel days (understatement), celebrating the little wins and bonding with inspiring people around the world. Without CAC, I never would have experienced the pure energy Haitian Initiative coaches could introduce to a training session, or the complexity into which the Inder coaches in Medellin would delve into the issue of child abuse, or the bright smiles and positivity we would see from coaches in Iringa, Tanzania. Most importantly to me, CAC is a chance, an opportunity. It is an opportunity to work toward something great with like minded people. It is the chance to challenge your own beliefs and to question everything. CAC is the opportunity to change just one life, and as long as there is that chance, this work will always be worth doing. Thank you to my CAC family and all of the incredible people I had the pleasure of working with around the world; you have all inspired me.